Will remember us as great ones. The life which we so easily can. Only these ideas can make a hero like him !! We listen to such ideas always, but we seldon believe them, or I should say, we seldom think they are realistic. People like Rashid Minhas show us that maybe our definition of being "realistic" should be revised. Well said, Rehan. We need to revise our definition of "realistic". In the PTV play about Rashid Minhas, none of these poems or entries from Rashid's diary were included: to keep the play "realistic"! I want to ask: do we become realistic by avoiding reality or by accepting it? The personality of Rashid Minhas is being unfolded in an amazing manner. Thank you Khurram sb for giving such insight about a person who becomes a role model of every child when studied in the text books of primary classes but that idealism usually fades away with the growing span of time. I was enthralled by reading his own writings that how he lived upto his passion. "So that generations to come Will remember us as great ones." I would like you to comment about the role of opportunities in fulfilling one's goals. Rashid is a hero because he got an opportunity and he made full use of that opportunity. He was indulged in a critical situation and he reacted instantly. So what role does an opportunity play in making someone a hero and immortal? We often find people with amazing goals but they remain goals since they keep on looking for opportunities and didn't get one. 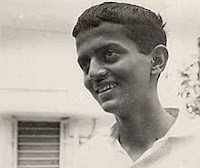 Waiting anxiously for the next posts on great Rashid Minhas!! When PTV broadcasted a drama based on Rashid Minhas,there was also a poem " I shall rise" which he read from his diary. i dont know if he wrote this poem himself or if he was just inspired by that. i just want to request can you post that poem here if you have? This peom simply reveals that in a very young age of only 15 years, Rashid Minhaas had understanding of what life is in this world. Just a game. Nothing more. Actual an long lasting is to be hereafter. So, our deeds must be focused on that. Imran, Reebz and LiveLife, thanks.